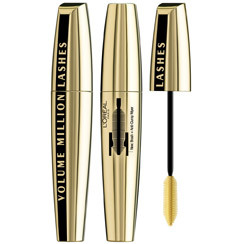 When I finally used the last leg of my mascara last week I decided to try the new L’Oreal Volume Millions Lashes mascara, I was especially tempeted by the advertisement on tv for it. This was a big thing for me because once I find a mascara I like and works well for me I usually get comfortable and stick with it unitl its discontinued lol. L’Oreal Volume Million Lashes mascara definitely does what it says because after I applied it to my lashes I had instant volume even after one coat. When using the brush the mascara glides on smoothly making it very easy to use and doesnt clump either which makes this mascara a must have in every female’s cosmetic bag. However, I do find that despite L’Oreal claiming the brush removes excess mascara I do find that more than enough of the mascara still makes it onto the brush therefore, caution is needed when applying the mascara especially to the lower lashes. My final verdict: After only using it for a week I can say that I absolutely love this mascara and has it is a good contender to my Max Factor Masterpiece Max mascara that I also love. I have already recommended it to my friends and family and I will definitely be repurchasing this mascara when it runs out. erm you sold me this one, great review! Trust me guys this is a great mascara with instant results! Yay you bought it!!! It has become my fav mascara at the mo, what do you think of it? @Blazerwhore I defo think you should try it im in love with it & I think you'll love it too. I just got this today. Used it once so far and instantly impressed. I like the design too but not sure about the smell, not so pretty! wowww the difference is incredible. hum i might buy one. look at my blog, i also make pictures of my eye. 1 pic without mascara and one with the loreal mascara. what do you say about the result? wow i can't wait to try this mascara! thanks for the awesome pictures that really show the great results! you can definitely tell a difference from before/after! It seems I've been looking for the perfect mascara my whole life. This is not it! I used it for the first time today, and was so disappointed. My lashes clumped together, it smells awful, and the "black-brown" shade was too black for me. I'm a fair redhead, so I really prefer brown mascara but it's hard to find. I should have stuck to my Cover Girl "Lash Perfection" in brown instead of wasting $10.00 on this product. Very disappointing.